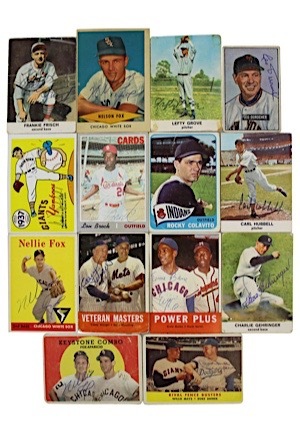 Offered is a lot of autographed baseball cards from many Hall of Famers and stars. The autographs are done in blue ink and are highlighted by a dual-signed Ernie Banks, Nellie Fox, Duke Snider, Lefty Grove, Frankie Frisch, Carl Hubbell, Lou Brock and many others. Accompanied by a LOA from JSA.